Celebrate your home team with this architectural homage to famous American ballparks. Those memories of evenings out at the ballpark can grow larger than life: the crack of the bat and the roar of the crowd as history is made again and again. 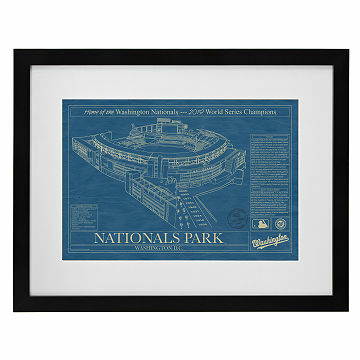 Celebrate your love of the game with this large version of our classic Baseball Stadium Blueprints. Evoking the nostalgia of midcentury architectural plans, these illustrations lay out the details of some of the game's legendary ball fields. Each drawing is accompanied with that stadium's design specs and highlights game stats of particular interest. The completed print has an aged finish that gives the impression of a vintage document. Printed on museum-grade, archival paper and framed in black BonanzaWood using acid-free archival board. Made in Portland, Oregon. Check out our smaller version of the Baseball Stadium Blueprints here, and our Large Baseball Stadium Blueprints Team Colors here! Please click here to see Examples of Available Ballparks! The blueprint is well mounted and framed. It includes salient facts about the ballpark as well as the team. Excellent gift! Arrived yesterday and I am impressed. I was worried about ground shipping 2,000 miles but this was securely packaged and arrived in excellent condition. I bought for my boss who is a baseball fanatic. His birthday is not until 3 more weeks (I ordered early and you got it here faster than I thought!) but I am sure he is going to love adding this to his wall aka shrine! This item arrived with significant problems in the quality of the mounting of the print to the board beneath. Many bumps and wrinkles, almost as if there were too much glue that warped it (not sure what the real reason was). UncommonGoods took it back quickly and without hassle. The second print arrived with less issues but mounting of the print to the board beneath is still not smooth the way you would expect from a typical high quality mounting job. I ordered the Citi Field print for my boyfriend who is a huge Mets fan. I received the package sooner than expected and the print is perfect. The frame is of excellent quality as well. I would definitely recommend this product! I am extremely happy with my purchase! Other than shipping issues, the piece itself was worth the wait and the recipient was very happy with it. Framing is good quality and a baseball fan will appreciate the piece. My husband loves this print in his new home office. It was a picture of a french bulldog not Wrigley Field.